Calgary signed Love as a free agent on Aug. 28, 2013. 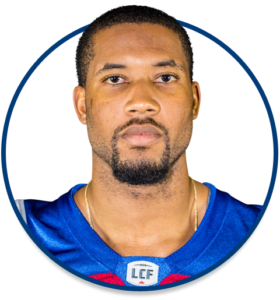 Love signed with the BC Lions in 2012 and also attended training camp with BC in 2013. (Calgary) Love played 10 games (two starts) and had 11 defensive tackles, a team-leading 21 special-teams tackles and a fumble recovery he returned for 15 yards. He started the Western Final where he recorded five tackles, two special-teams tackles and an interception and also started in the Grey Cup where he registered 10 tackles and three special-teams tackles. He was placed on the six-game injury list before Game 3 with a shoulder injury. He was activated before Game 10 and was on the reserve list and returned to the line-up for Game 11. (Calgary) Love played 14 games (six starts) and had 29 tackles, two tackles for a loss of six yards, an interception for 10 yards, a fumble recovery, a knockdown and 12 special-teams tackles. He was on the one-game injury list for four games. Love also played in both playoff games and had one tackle and four special-teams tackles. (Calgary) Love played 15 games (one start) and had seven tackles, a sack and finished second on the team with 20 special-teams tackles. He was named special teams player of the week for Week 18. He was on the reserve list for the first game of the season and the one-game injury list for Games 7 – 8. Love also played in the Western Final but was on the injury list for the Grey Cup. (Calgary) Love was on the practice roster before being activated on Oct. 11 against BC. In four games he had nine tackles including a tackle for loss, three special-teams tackles and a quarterback sack. He recorded his first sack on Oct. 18 against Edmonton. Love also played in the Western Final and registered one tackle. (BC) Love played one game as a reserve linebacker for BC and did not record any stats. Love played four seasons with the UCLA Bruins (2008-11). He played two seasons at safety before making the switch to linebacker. Over the course of his collegiate career, he made 105 total tackles, including six tackles for loss, and had two sacks. As a senior in 2011, he had 39 tackles, including 4.5 tackles for loss, and one sack. Love starred at Hamilton High School in Chandler, Ariz., and as a senior he was named the state’s No. 7 college prospect by rivals.com. He was first-team all-region in 2006 after recording more than 100 tackles and a school-record 10 interceptions. His father Glenn Sr. played football at the University of Illinois.